The Mount Nansen-Nisling River area is underlain dominantly by Paleozoic rocks of Yukon Tanana terrane, and Triassic to Paleogene successor rocks. Rocks to the east are dominated by the Mississippian Simpson Range suite that is intruded by the voluminous Early Jurassic Long Lakes suite. The western geology is dominated by metasedimentary rocks of the Snowcap assemblage and Stevenson Ridge schist, and lesser Finlayson assemblage metavolcanic and metasedimetary rocks. Permian Sulphur Creek suite forms sparse intrusions of K-feldspar augen granite. The northern geology is dominated by the mid-Cretaceous Whitehorse plutonic suite and Mount Nansen Group volcanic rocks, that locally host Cu-Au porphyry and Au mineralization. Late Cretaceous Casino suite hypabyssal rocks are present sparsely across much of the area with and have known porphyry and epithermal mineral potential (e.g. Klaza). Paleogene volcanic and hypabyssal rocks are sporadically across the map, and are more prevalent to the southwest. Western Yukon is host to numerous mineral deposits that contain economically important metals such as copper and gold. The distribution of these mineral deposits is controlled by the underlying geology, including rock type and deformation history. 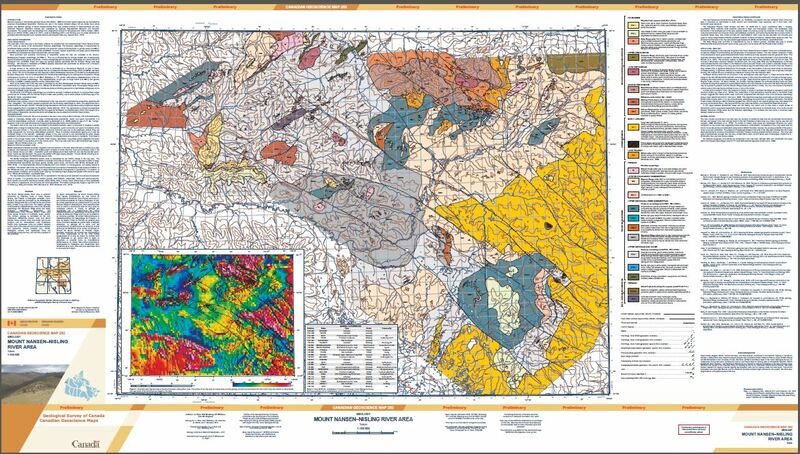 This CGM map presents a new 1:100 000 scale geological map of the Mount Nansen - Nisling River area of SW Yukon that is based on regional mapping in summer 2015, and integration of modern geophysical, geochemical and age data. The map identifies distinct groups of rocks that share common origins and histories, some of which have potential to host specific types of mineral deposits. This map represents significant improvement on the understanding of regional geology and mineral deposits in western Yukon.